Appropriate hardware enhances the look and feel of your window. CoCo Curtain Studio has a wonderful selection of window hardware that is beautifully crafted and designed. We offer The Finial Company, Paris Texas, Houseparts, Antique Drapery Rod, Gould, Kirsch, and many others. Our curtain and drapery hardware comes in standard or custom colors. We offer a classic or contemporary range of brackets, cables, rods, finials, and rings in an assortment of finishes including antique gold, contemporary brushed nickel and chrome. We sell and install motorized traverse rods for your home or office. Curtain rods can be decorative, functional, or both. Functional hardware is discreet and out of sight. The rods below are inexpensive aluminum rods which can be hidden in rod pockets or behind pleated curtains. Decorative hardware is to be seen, to accessorize the window treatment and complement the overall colors and design. Our custom design services assist you in measuring, choosing and installing the right window hardware for your needs. 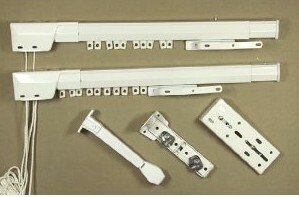 To explore our large collection of window hardware, visit one of our showrooms and talk to our expert staff. CoCo Curtain Studio conveniently has three locations serving the Philadelphia, PA, Ridgewood, NJ and Amarillo, TX areas. Whether you live in New York City, Philadelphia, Ridgewood, Devon, PA or Amarillo, TX we are available to consult, measure, and install ideal window treatments for your home or office.